Whole30 Jerky: 4 Places to Find the Meaty & Compliant Jerky! Whole30 Jerky: The Meatiest, Cleanest Jerky Around! These 100% grass-fed beef sticks are naturally cured and are officially endorsed by the Whole30 program – hurrah! They’re great as pre-workout snacks, or when unexpected hunger situations happen. 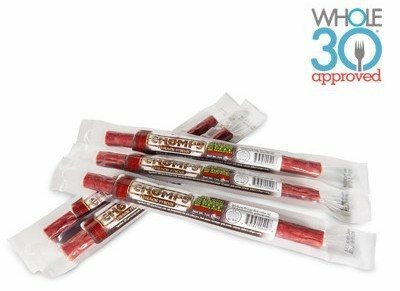 Chomps jerky sticks are free of synthetic nitrates, nitrites, and MSG. The only preservative used is natural – it’s celery juice! They are also shelf stable for an entire year, so stock up and keep them in the cupboard. Chomp’s Whole30 compliant jerky in three flavors – Classic, Hoppin’ Jalapeño, and Crankin’ Cran! Where to Get It: You can buy them in packs of 12 or packs of 24 online! We talk about Epic quite a bit in our article detailing the best Whole30 protein bars, but did you know that Epic makes jerky strips too? Note: There are actually a few more varieties, but the Wagyu Beef Steak and Smoked Salmon Maple jerky sticks are NOT compliant, as they contain honey and maple sugar, respectively. Where to Get It: Epic jerky is available on the Epic website or in some brick and mortar locations (particularly health food stores). If you need some beefy goodness, but don’t mind the method, Epic also offers beef-based bars and meat bites (which are basically shredded jerky pieces). They even offer a Whole 30 starter kit, complete with an assortment of their Whole30-friendly bites and bars! You can find Epic bites on the Epic website, Thrive market, or Amazon. Sophia’s Survival Jerky is officially Whole30 approved! 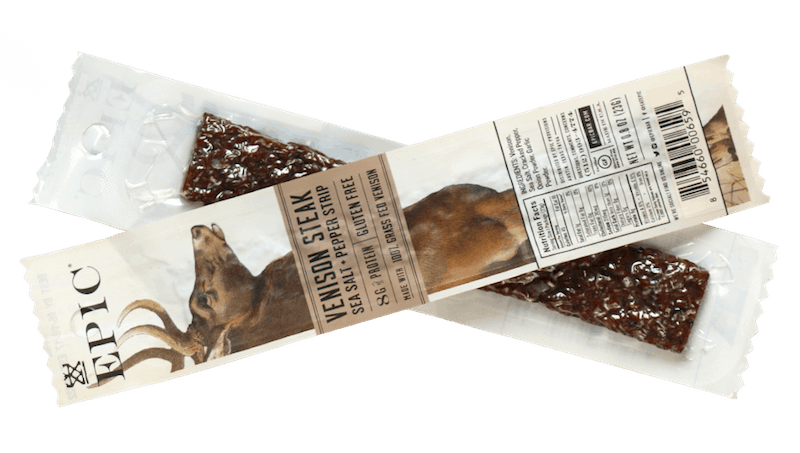 This meaty, clean ingredient jerky is made from hormone free, US-sourced, 100% grass-fed beef. The jerky is gluten, soy, any dairy-free, with no artificial preservatives and no refined sugars! 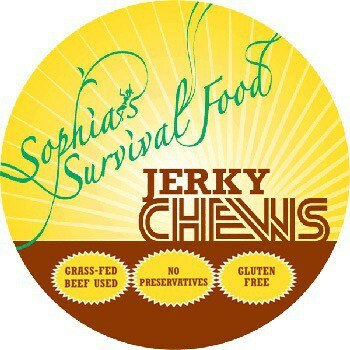 Sophia’s Survival Jerky comes in 4 flavors: original, mild, spicy, and chipotle raisin. Where to Get It: You can grab Sophia’s Survival Jerky on their website. Brooklyn Biltong is another jerky vendor that is officially endorsed by Whole30, so you know you’re in good hands. Their jerky bites are gluten-free, MSG-free, and nitrate-free. The jerky comes in the form of shredded pieces in sealed packages, so they serve as really great on-the-go snacks. They also work really well for spreading on salads! Where To Get It: Brooklyn Biltong jerky bites are available online and in a few limited locations in NYC.